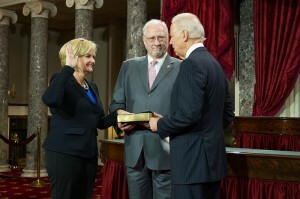 U.S. Sen. Claire McCaskill, democrat, officially began her second term as U.S. Senator from Missouri on Thursday. “I pledge to use these next six years to keep fighting as hard as I know how for the state that I love,” said McCaskill, a former Jackson County Prosecutor and Missouri State Auditor. McCaskill was re-elected to her second term in the U.S. Senate in the Nov. 6, 2012 general election. She will serve with freshman U.S. Sen. Roy Blunt, a republican, who ends his first term in 2016.